Don’t be deceived by this cute little elephant marching on the cover. 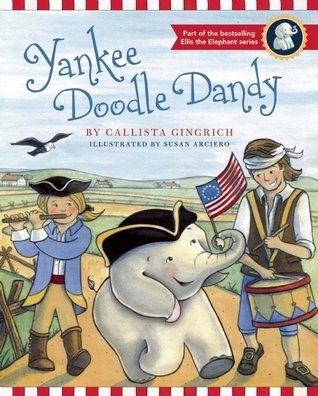 This is not a funny-silly sing-along, this picture book is a history lesson of the American Revolution told in rhyme by Callista Gingrich, as Ellis the Elephant learns a little bit about America’s fight for freedom and independence. It’s written and illustrated for early primary students. Ellis, whose name immediately makes you think of Ellis Island, imagines himself in daily situations both pre- and post- revolutionary times. He sweeps the floor as the British soldiers come to a storefront, he wears a native headdress as the Sons of Liberty dump tea into Boston Harbor, he stands with Patrick Henry as he quotes ‘give me liberty or give me death’, and he looks out a bedroom window as Paul Revere rides through the town. Each page is an introduction to a much larger historical account. Reading it cover to cover only takes a few minutes, but it can easily be a springboard to learn more about each or any of the individual events. Susan Arciero’s illustrations draw the reader into each scene with rich details not given in the verse, yet are simple enough to give a young reader a basic understanding of each event. Ellis the Elephant is a bystander. This gives the impression that a child is getting a glimpse of history unfolding. She is true to the dress and nature of the participants as well as details of the era, candlesticks, bonnets, quill pens, muskets, sewing needles, carts with wooden wheels, etc. And one little detail I came to look for on each page was a baby bald eagle perched somewhere in each scene. I enjoyed the book and I think young children will enjoy reading it, or having it read to them. The rhyming verses and the cute little elephant and eagle make history fun to learn. And really at this age, kids should be having fun while they learn. Time for in-depth study of the American Revolution will come soon enough. I imagine a little Yankee Doodle Dandy will go a long way in getting kids interested in learning more about history.